You must make reservations at least 5 minutes in advance of the time at La Vida Cantina. 7 levels of convenient, free self-parking is available in the center's parking structure. Valet parking is also available. Live music every Tuesday, Thursday & Friday! La Vida Cantina is an authentic Mexican restaurant and bar with a captivating atmosphere and a menu of fresh, high quality ingredients where traditional recipes are presented with a modern twist. Guests will enjoy a spacious, lively and beautifully designed atmosphere patio with a large pentagon-shaped bar, ample lounge seating and five fire pits, all under tow over-sized palapas. The interior features dark wood, warm lighting and contemporary Mexican murals. 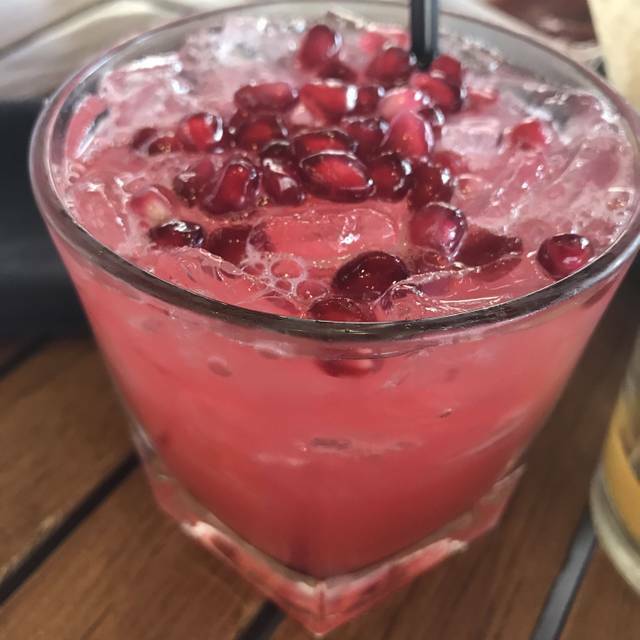 The extensive cocktail menu features premium tequilas, an amazing array of uniquely crafted margaritas and signature martinis. Excellent food and service. A very cool vibe with a delicious but relatively inexpensive menu. Particularly on Taco Tuesday! Our waiter was THE BEST. I didn’t catch his name but he was an older Hispanic gentleman and he was very attentive. He made the experience much better! My first time their and was not impressed. Went with someone who had really liked in the past. Wasn't extremely busy but the service was really bad - the basics, utensils, side plates had to be asked for as well as clearing our table when new food was coming out. Waited a long time for initial contact by server and drinks. The service was poor I know you guys are busy but being nice isn’t that hard. The food was cold and the tortillas were soggy. Highly wouldn’t recommend going on taco Tuesday ever again. What a great and fun place ! Service a little slow, but place was extremely busy. Definitely will return. Free parking and just around the corner from movie theater. Great for taco Tuesday. It's busy so definitely make a reservation if you want a table and make it a few days in advanced! I only book La Vida through this up because of the hard time I have getting an on the stop table on a taco Tuesday. Honestly this place has poor food quality and horrible service. The waiters/waitresses are just so slow and I’m guessing inexperienced. Taco Tuesday at La Vida is mainly for the ambiance and to socialize with friends. The happy hour alcohol is reasonably priced but the happy hour food is tasteless full of dry meat and not worth the price. When this place first opened the food was much better. Love this place! I brought two couples with me that have never been and they were also impressed. They had my reservation ready quickly plus food & service were amazing! My only critique would be that the live musician was really good, but extremely loud! We had to talk loud and still had people at the table that could not hear each other. For a bar where you're standing close that might work, but Sunday brunch it was a little much. Amazing food. Got put outside when it was raining and was so cozy and warm with the heaters. Our waiter was great and the red sauce on my wet burrito was fantastic. Chips and salsa was the best I ever had. Can’t wait to go back. Had a reservation yet it took 10 minutes for a waiter to come, another 10 minutes for our drinks to come, and the food came before the appetizer we had ordered. The place wasn’t very well kept as there were traps everywhere. Also, there was a massive chicken wishbone in my enchilada that hurt like heck biting into. We had to ask three times for water because we never got it after asking the first two times. Excellent service. Food was average. I was very disappointed. I had my birthday dinner here. Some of my guest waited way too long for there food. Some had to ask twice for their drinks. Our table wasn’t ready at the time of the reservation. Never again will I go to this place. Carlos was amazing. Very attentive! We love this place a lot and will definitely be back another zillion times. Definitely a YOUNG crowd here. 90% of the people there were drinking, not eating. I’m only 32 but felt too old and out of place. Went here for dinner on a Tuesday to find that they were running a limited menu for taco Tuesday. I understand having taco specials on taco Tuesday but removing your normal menu?? That doesn’t really make any sense to me. I ordered their house margarita and it was hands-down the worst margarita I have ever had in my life...from a MEXICAN RESTAURANT no less. I don’t expect the world from a $5 house marg but it was pure sour mix. I would have rather had a premixed Jose Cuervo margarita from the grocery store. It was super loud and the music choice was...interesting...kept switching from terrible rap to old schools rock. “Indoor” seating was freezing because the huge front door/window was kept open. Needless to say this was my first and last time going to La Vida Cantina. A group of 12 of us spent New Year’s Eve here. It was okay, food was alright the ceviche was mediocre at best. Some of the drinks were good, the old fashion was horrible bartender didn’t make it right. At the end of dinner it we asked the waitress to split our bill, it took her just under and hour to do so! That’s not acceptable. She apologized and told us it was complicated to split up orders, in my opinion this is a failure in proper training. Waitresses/waiters should ask in advance for larger parties if they would like their bill together or separate so that they plan accordingly. Keeping customers waiting for an hr to pay and leave should not be acceptable. Came here with a large group for New Year’s Eve. While the food and company was great, the service was crappy. They also added on a 20% gratuity since it was a large group but I would not have tipped 20% as the service was that bad and slow. I usually like La Vida Cantina very much. It is a fun place for good food, good drinks and people watching. This last visit was good, but restaurant did not have the Bacon Wrapped shrimp and the other menu options seemed too much alike. And then my husband’s dinner came out and he was 3/4th finished- even trying to eat slow before mine came. We asked everyone to look for it. And after no explanation, it finally comes. Pretty weird. My friend and I went in yesterday and both ordered the tamales. The tamales were dry and hard. So we sent them back. Then we ordered chicken fajitas and a cheese enchilada. The fajitas had no flavor at all. They were cooked in some kind of sauce that looked like Tabasco sauce. Absolutely zero flavor and no grill marks on the chicken or bell peppers. Also, the sides that it came with were just as bland. (re fried beans, guacamole and rice). The cheese enchilada was disappointing as well with no flavor. We sent back the first set of dinner entries, but were afraid to send back the second so we didn't' event eat it, we just asked for the check and left. The waitress asked if we wanted a to go box and we said no. The waitress didn't even ask why we didn't eat our food or if we even liked it, since we already said we were unhappy with the first one. We do not recommend this restaurant at all. Very disappointing food and service as well. Will not return. Your restaurant notified me at 551 prior to my 645 reservation that the health dept showed up & they were moving my reservation of 10 to 8 p.m. at 7 you called to notify me you would be closed indefinitely. Very accommodating to our party. Great food and service. Eric was great! Especially loved the Pineapple Jalapeno Margarita and Seafood Enchiladas! My first time here and it wasn’t so good. They sat my friends and i right under the sun it was hot and our server took more than 10 minutes to come help us. Someone finally came and we asked to be moved to the shade. But after placing our food order it was out quick. Went for taco Tuesday and reserved beforehand. Service was great we were seated even though are full party wasn’t all there and Gio our waiter was excellent. Overall great night. The food was tasty. I definitely recommend making an online reservation because they are super busy, and might not be able to get to the phone. Please be on time. It's very lively and has a mixed crowd. The live band during dinner was nice, but then after dinner the DJ made it even better. Please make sure you tip accordingly because it was great service despite the heavy demand they have on them. Food was basic, not many options for tacos on Taco Tuesday. Service was awful, our waiter took about 15 minutes before noticing us. Beware there is a time limit (2 hours) seating for Taco Tuesday, still not quite sure why they told us 1 hour. This is basically a nightclub with food service type of ambiance. Dress to impress, not recommended for casual dining. Our server Eric was awesome. There were plenty of employees around that would check in with us as well. We sat on the patio by a fireplace which made the whole experience nice. The food is pretty good, but since there are plenty of options in So Cal for Mexican food, I would say the ambiance sets this place apart. P.S. There is plenty of parking in the parking garage and there was no fee to park. Seems like a no-brainer. Came here with my family and some friends to celebrate my sisters 21st bday party. The atmosphere was great and we had wonderful service. The singer called out my sister and sang her a bday song and we didn't request that so the server just picked up that it was her bday and made it special for her. Great food, awesome bottomless mimosa / bloody mary deal for brunch. Great service and fun atmosphere . Super chill and great location.